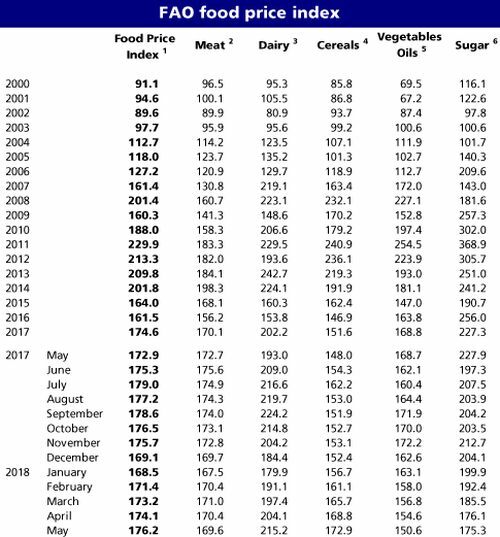 » The FAO Food Price Index* (FFPI) averaged 176.2 points in May 2018, up 2.2 points (1.2 percent) from April level and hitting its highest level since October 2017. The increase in May reflected a continued steep rise in dairy price quotations, while those of cereals also rose, albeit at a slower pace. 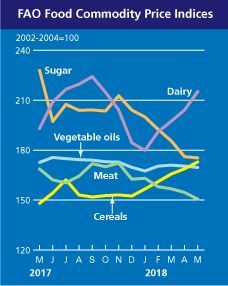 By contrast, vegetable oil and sugar markets remained under downward pressure whereas meat values changed little. » The FAO Cereal Price Index averaged 172.9 points in May, 4.1 points (2.4 percent) above its April level. 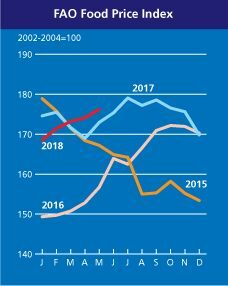 The index continued on an upward path since the start of this year, standing in May at almost 17 percent above its corresponding value a year ago and reaching the highest level since January 2015. International prices of all major cereals have strengthened considerably in recent months, and in May wheat values gained largely on concerns over production prospects in a number of major exporting countries. International prices of leading coarse grains also rose, mostly due to deteriorating production prospects in Argentina and Brazil. Sizable purchases by Southeast Asian buyers kept international rice prices firm in May, notwithstanding weaker currencies of some top exporting countries and soft demand for aromatic and parboiled rice. » The FAO Vegetable Oil Price Index averaged 150.6 points in May, down by 4 points (2.6 percent) month-on-month, marking a fourth consecutive decline and a 27-month low. The slide mainly reflects weakening values of palm, soy and sunflower oils, whereas rapeseed oil prices rebounded from their April’s multi-month low. As for palm oil, despite prospective production slowdowns in Southeast Asia, international prices fell due to sluggish global import demand and large inventories compared to last year. In the case of soy oil, ample supplies and stocks resulting from meal-driven crushing continued to weigh on world prices. The rise in rapeseed oil prices mainly reflected concerns about unfavourable weather conditions affecting the 2018/19 crop in parts of Europe. » The FAO Dairy Price Index averaged 215.2 points in May, up 11 points (5.5 percent) from April and marks the fourth month in a row for the index to rise. The index value stood at 11.5 percent higher than in May 2017, yet still 22 percent below the peak reached in February 2014. The rise in May was mainly driven by sizeable increases in the price quotations of cheese, Skim Milk Powder (SMP) and butter, as those of Whole Milk Powder (WMP) were virtually unchanged. Tight supplies in New Zealand, the leading exporter of dairy products, are much behind the market firmness witnessed in recent months. » The FAO Meat Price Index averaged 169.6 points in May, marginally lower than in April. The small decline in the index in May reflected the easing of pig meat and ovine meat prices, while those of poultry meat rose slightly. International price quotations for pigmeat and ovine meat weakened, on lower imports by China in the case of pigmeat and on a stronger US dollar for ovine meat. While poultry prices are estimated to have increased slightly, poultry markets became difficult to monitor in recent weeks because of the uncertainty surrounding the situation in Brazil, the world’s largest poultry exporter, where millions of birds were reported culled following a prolonged truckers’ strike in May. Bovine meat prices remained steady on a generally well-balanced market situation. » The FAO Sugar Price Index averaged 175.3 points in May, down slightly (0.5 percent) from April, marking the sixth consecutive monthly decline. The latest decrease in international sugar prices mostly reflects expectations of a large sugarcane output as a result of favourable harvesting conditions that prevail in the Centre South region of Brazil, the world’s largest sugar producer and exporter. Concerns over a prolonged dryness affecting cane yields in some part of that region lacked strength to reverse the market trend. Likewise, reports that Brazilian mills continued to favour ethanol production over sugar, with only about 37 percent of the sugarcane harvest directed for the production of the sweetener, failed to provide enough support for sugar prices to increase.